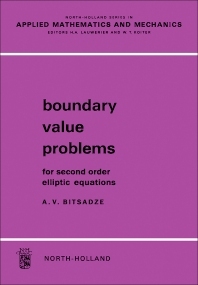 Applied Mathematics and Mechanics, Volume 5: Boundary Value Problems: For Second Order Elliptic Equations is a revised and augmented version of a lecture course on non-Fredholm elliptic boundary value problems, delivered at the Novosibirsk State University in the academic year 1964-1965. This seven-chapter text is devoted to a study of the basic linear boundary value problems for linear second order partial differential equations, which satisfy the condition of uniform ellipticity. The opening chapter deals with the fundamental aspects of the linear equations theory in normed linear spaces. This topic is followed by discussions on solutions of elliptic equations and the formulation of Dirichlet problem for a second order elliptic equation. A chapter focuses on the solution equation for the directional derivative problem. Another chapter surveys the formulation of the Poincaré problem for second order elliptic systems in two independent variables. This chapter also examines the theory of one-dimensional singular integral equations that allow the investigation of highly important classes of boundary value problems. The final chapter looks into other classes of multidimensional singular integral equations and related boundary value problems.